Lano Relief Skin Stick™ has pure New Zealand lanolin and Manuka oil. SKU: LRSS-GMS. Tag: Lano Relief Skin Stick. 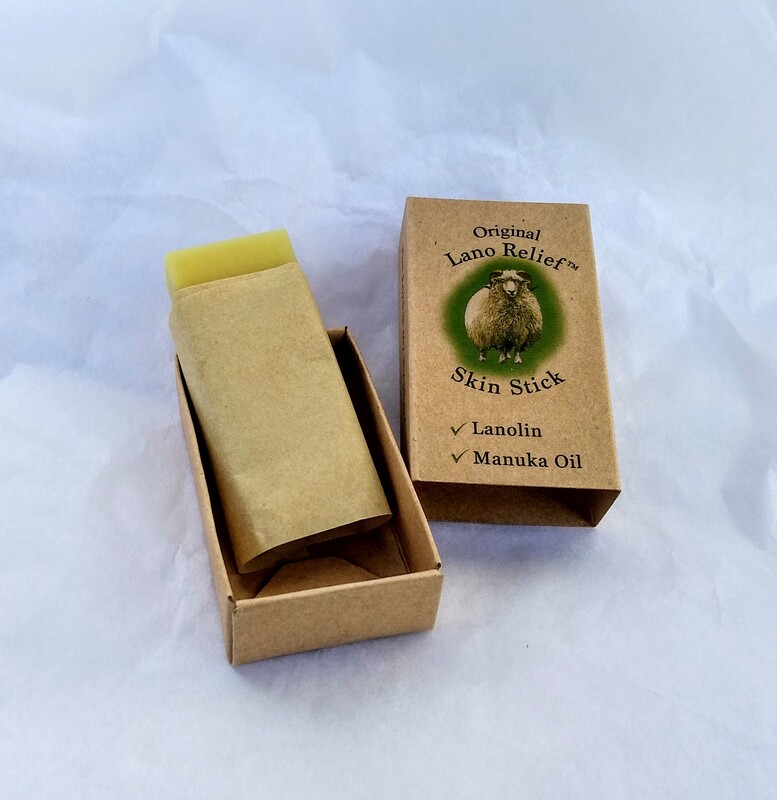 Pure NZ Lanolin + Manuka Oil at your fingertips, without the gooey mess or unpleasant smell of sheep! Manuka honey is made by honeybees going to the blossoms of Manuka trees; Manuka oil is made from steam distilling the whole branches of Manuka trees. Manuka, unlike its counterpart Tea Tree in Australia, has a gentle sweetish aroma. Every part of a Manuka tree has been used by the Maori people for medicinal purposes for generations. Net 13g approx. This unique skin stick comes in a new plastic-free recycled paper box, much like a matchbox. Ideal size for carrying around in your bag. Have a skin stick for your face/lips, another one for your heels, then another for your bag etc. Applied on your lips before a lipstick, it will achieve a nice translucent effect. A skin stick is also referred to as solid moisturiser or hard lotion. NZ postage $2.07 including GST additional. Lano Relief Skin Stick™ – Proudly Made in New Zealand in Te Anau, Fiordland, in the South Island.